Tet has become so familiar, so sacred to the Vietnamese that when Spring arrives, the Vietnamese, wherever they may be, are all thrilled and excited with the advent of Tet, and they feel an immense nostalgia, wishing to come back to their homeland for a family reunion and a taste of the particular flavours of the Vietnamese festivities. 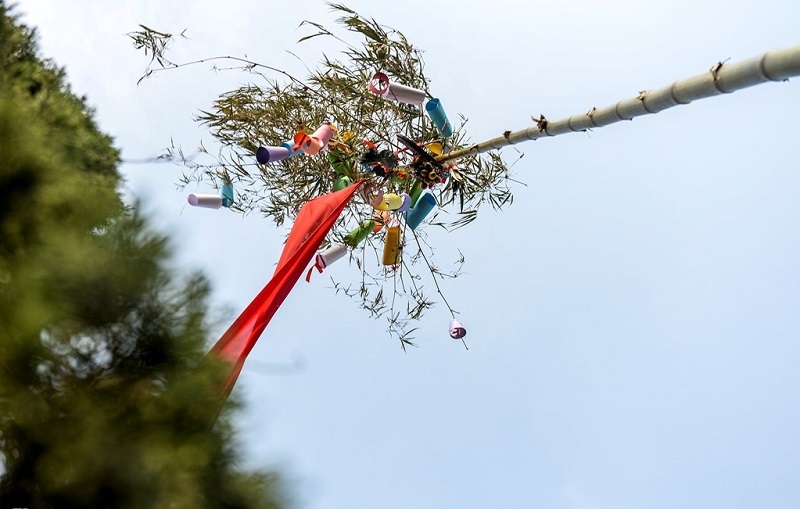 Cay neu is a bamboo pole (New Year's Tree) stripped of its leaves except for a tuft on top. Red paper is used to decorate the tree, which is planted outside the house during the Tet holiday. The cay neu has Taoist origins and holds talismanic objects that clang in the breeze to attract good spirits and repel evil ones. On the very top, they frequently place a paper symbol of yin and yang, the two principal forces of the universe. Sometimes a colorful paper carp flag will fly from the top. The carp (or sometimes a horse) is the vehicle on which the Kitchen God travels to make his report. This tree is more common in the countryside now than in the city.It is ceremonially removed after the seventh day of Tet. According to Vietnamese legend, once upon a time, in the East of the Soc Son Mountain, North Vietnam, existed a gigantic peach tree. The tree was so huge that its shadow extended through out a large area of land. Up on the tree, lived two powerful deities, Tra and Uat Luy. They protected the people of the land in the surrounding areas from the devils. The devils were so afraid of these two deities that even the sight of the peach tree haunted them. However, at the end of every lunar year, these two deities had to fly back to heaven for an annual meeting with the Jade Emperor. During this time, the devils took advantage of this opportunity to harass the peaceful inhabitants. To fight the battle against these devils, people came up with the ideas of display a branch of the Peach tree in the house to scare away the devils. Since then it becomes a custom of the North Vietnamese to have a branch of a Peach tree during Tet season to protect themselves against the Satan soldiers. Those who don't have Peach tree can draw the figures of the two deities, Tra and Uat Luy, on red paper, and display them in front of the house. 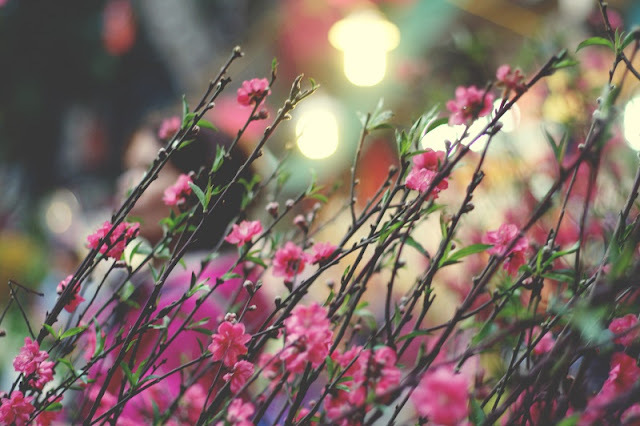 While Peach tree is preferred in the North, Hoa Mai is more commonly used for this ceremony in the South because of the warm weather. 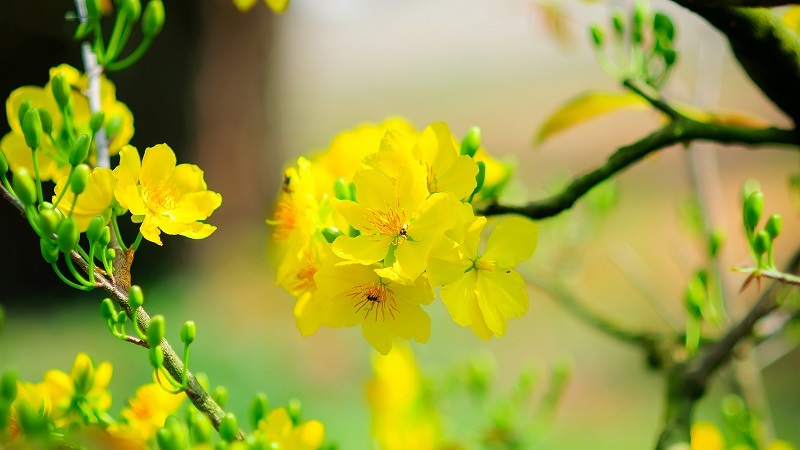 Hoa Mai is a small, yellow flowering plant that is used for decoration during Tet with the meanings of prosperity and well-being for the family. The value of these flowers is determined by the number of petals - the more petals, the more expensive the flower. 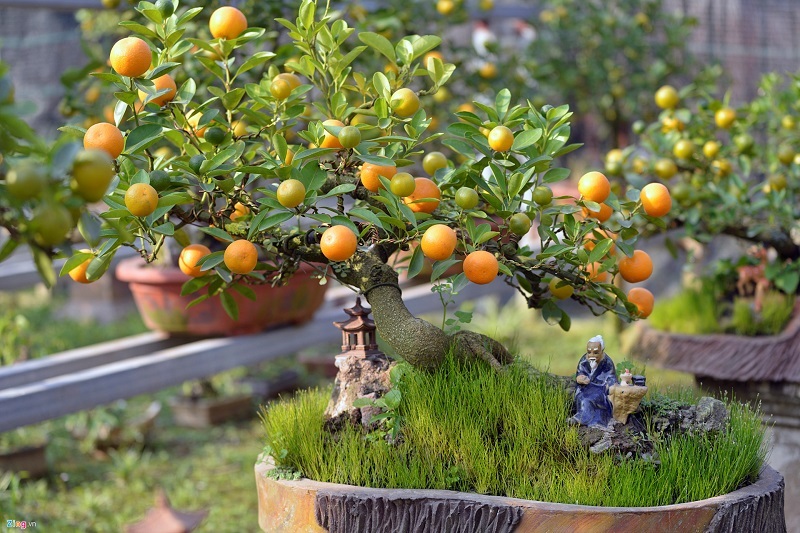 Kumquat trees about two or three feet tall are carefully selected and prominentlyImage displayed during Tet. To carefully choose a kumquat bush, the buyer must pay attention to the symmetrical shape, to the leaves and to the color and shape of the fruit. The bushes have been precisely pruned to display ripe deep orange fruits with smooth clear thin skin shining like little suns or gold coins on the first day of the lunar new year. Other fruits must still be green to ripen later. This represents the wish that wealth will come to you now and in the future. The leaves must be thick and dark green with some light green sprouts. The fruits represent the grandparents, the flowers represent parents, the buds represent children and the light green leaves represent grandchildren. The tree thus symbolizes many generations. Guests will caress the light green leaves about to sprout and compliment the discerning host who chose so carefully. The "five-fruit tray" on the ancestral altar during the Tet holiday symbolizes the admiration and gratitude of the Vietnamese to Heaven and Earth and their ancestors, and demonstrates their aspiration for a life of plenty. As one theory goes, the five fruits are symbolic of the five basic elements of oriental philosophy: metal, wood, water, fire, and earth. 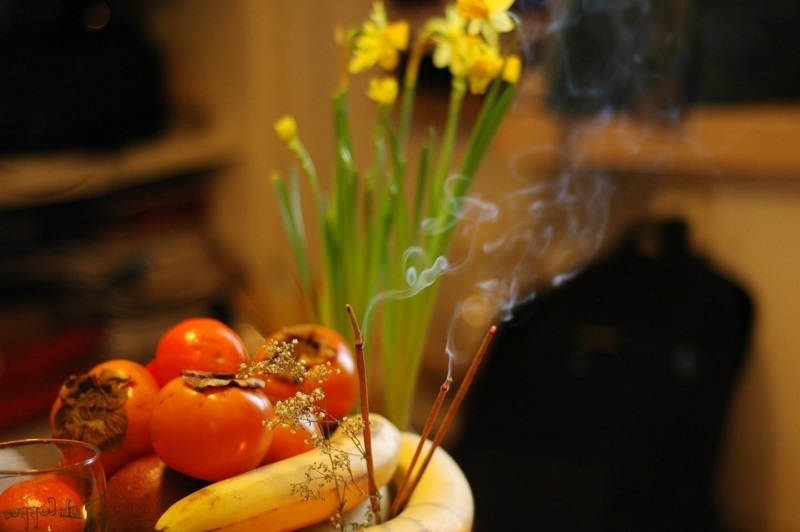 Some people believe that the five fruits are symbols of the five fingers of a man's hand that is used to produce physical wealth for his own use and to make offerings to his ancestors. However, in a simpler way, the five fruits represent the quintessence that Heaven and Earth bless humans. This is one of the general perceptions of life of the Vietnamese, which is "When taking fruit, you should think of the grower". Today, the tray may contain five or more fruits, in the form of a pyramid like before or in an different shape. Regardless, it is still called the Mam Ngu Qua, the five-fruit tray. It is the most featured and typical cakes on Vietnamese traditional New Year. 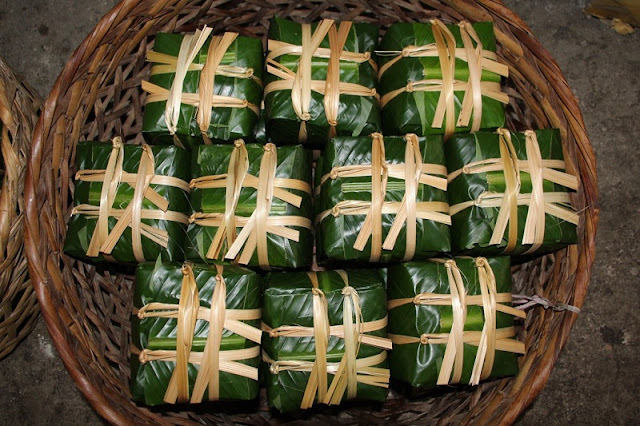 Legend and meaning of this cake is sure to know: "Rice is food for human consumption, glutinous rice to make round and square cake, to represent Heaven and Earth. The leaves are wrapped outside, inside is raw materials of rice, green beans and meat to represent the parents. The cake is square, which represents the earth. Cake for mother. This meaning and the ingredients to make it permeate the subtle, deep of the Vietnamese soul. The main ingredients for making cakes are glutinous rice, green beans, pork, characteristic of an agricultural wet rice economy. The way to process, package, boiled cake, showing high community. The whole family wrapped up the cake, soup in the air of the break of the day, so unforgettable memories.